Hey everyone! Today I'm starting a brand new 3 part series on gel nails. I should be posting today, tomorrow and Saturday night, but I wont make any promises because we all know how great I am at time keeping! If not everything will be up by Sunday. My first part in the series is a comparison of three gel polish starter kits. 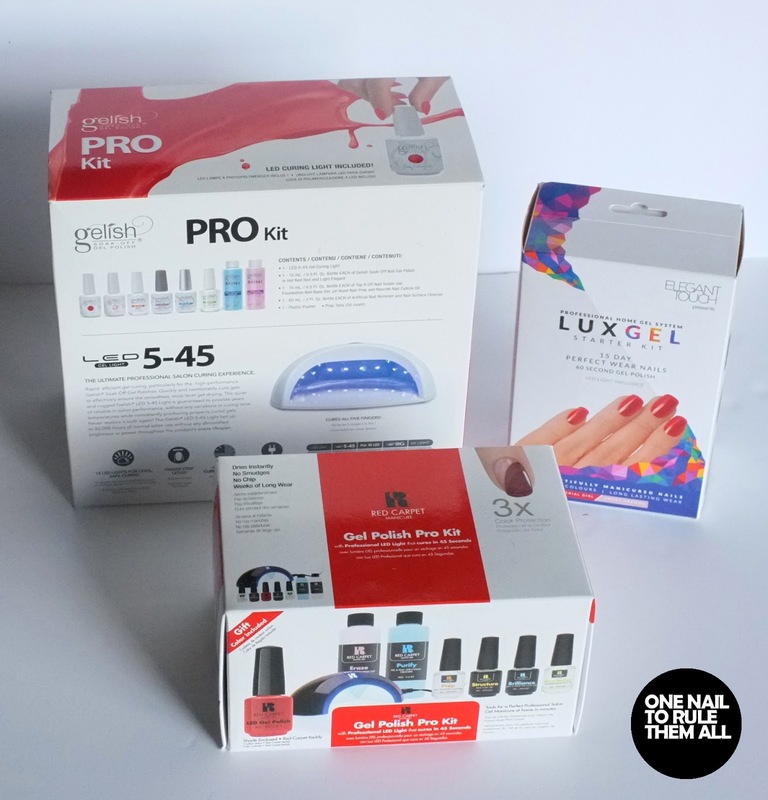 I've got the Gelish Pro 5-45 Kit*, the Elegant Touch Lux Gel Starter Kit*, and the Red Carpet Manicure Gel Polish Pro Kit*. I'd like to point out before I start that I am not qualified to do gel nails (although I am hopefully going to be soon!) 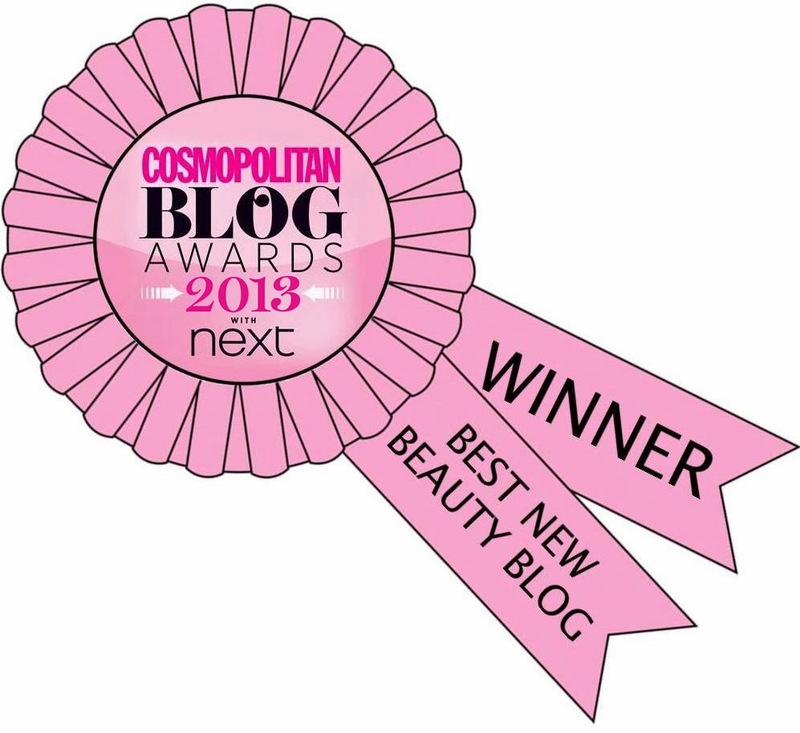 and these are purely my perspectives as a consumer, and of course as a blogger. Gelish is a more salon-based brand, but both Elegant Touch and Red Carpet Manicure are for home use, and I think it's useful to compare the three to see their pros and cons. - Packaged well, and easy to repack. Probably the smallest packaging of the three so easy for storage or for taking elsewhere. - Topcoat and basecoat are combined which I'm sceptical about as they do separate jobs (but, again, I'm not a professional so I could be wrong about this). It's a good kit for those starting out, or for beginners to practice at home before thinking about purchasing a more expensive kit. Once dried under the lamp, they do look and feel like gel nails do (as in, shiny and hard), but I did find that mine chipped after a week, and my sister's chipped after only a few days, but that may have just been my application. However, it is cheaper than the other kits I'm showing, so if you're on a budget then this is for you. - Full 15ml bottles in comparison to 4.5ml of Elegant Touch and 9ml of Red Carpet Manicure. - Includes buffer tabs and a cuticle pusher which also doubles up as the tool for the tabs to stick to, which is very helpful for prepping the nail. - As this is a salon brand these are all professional products, and as a result you can see the quality in them. All the products lasted, with no chips except once on my friend who was working around bleach all day, so I blame the bleach on that one. - The lamp is brilliant. 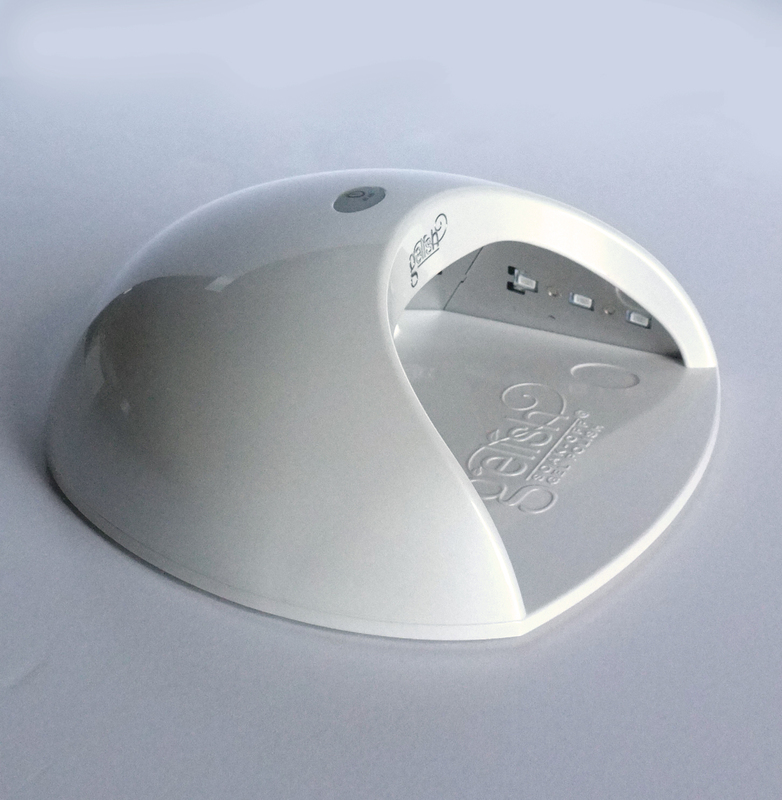 Not only does it cure all 5 fingers at once (which makes things 10x easier), but it also does it incredibly fast as it's the most powerful lamp of the 3 at 18W. I've included a picture below for you to see. Because it's white I was worried about staining it, especially when I managed to get red gel polish on the inside, but a quick wipe of the Nail Surface Cleanse and it was as good as new, so that's not a problem at all. - I think that the only con for me is the price, but it has to be remembered that this is a professional salon kit, so you would be expecting to pay more anyway. I really do love this kit, the price would perhaps scare me away as a consumer but as it isn't really made for everyday consumers this isn't a huge issue. You also get a lot for your money. 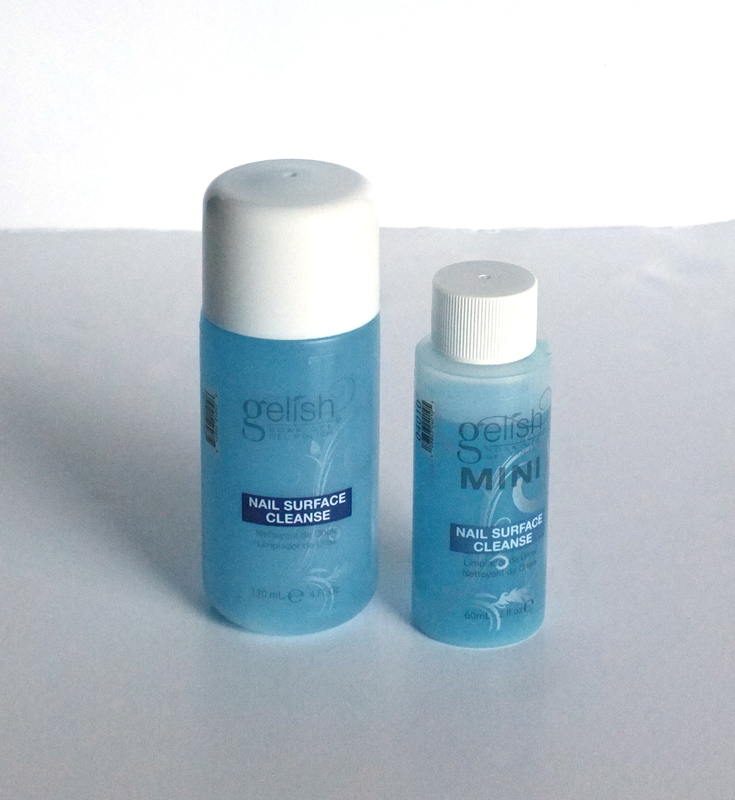 See the Nail Surface Cleanse for instance, you can also buy a 120ml version, but the 60ml version also does plenty of manicures. I've made a bit of a dint in mine but that's only because I stupidly spilt it! - High quality, I imagine this will soon make its way to salons as it's a very professional brand and the manicures I've done using the products have all lasted (including my holiday nails where I wore Red Carpet Reddy from this kit), except the first one I ever did which peeled off within days, but I'm pretty sure that's because I was rubbish at doing them first time! - Doesn't include buffer tabs like Gelish, BUT you can buy the accessories kit here which includes tabs and a pusher for £3.95, which is cheap enough to mean it doesn't matter too much that it isn't included. Overall thoughts: Definitely a good kit to start with at home, it's still high quality and not overly out of everyone's price range, and it's easy to store and transport as well. I think all of the kits are good for different things, none of them are bad, but it's hard to pick a favourite due to their different audiences. If I were in need of a cheap and easy to use gel kit I would use the Elegant Touch Kit, as a professional I would use the Gelish Kit, but to an everyday consumer I think the Red Carpet Manicure Kit is more suitable, so it's difficult to evaluate them against each other. I would say that they're all worth using, so whichever you purchase (for whichever catagory you fit in best of the above) you will not be disappointed. 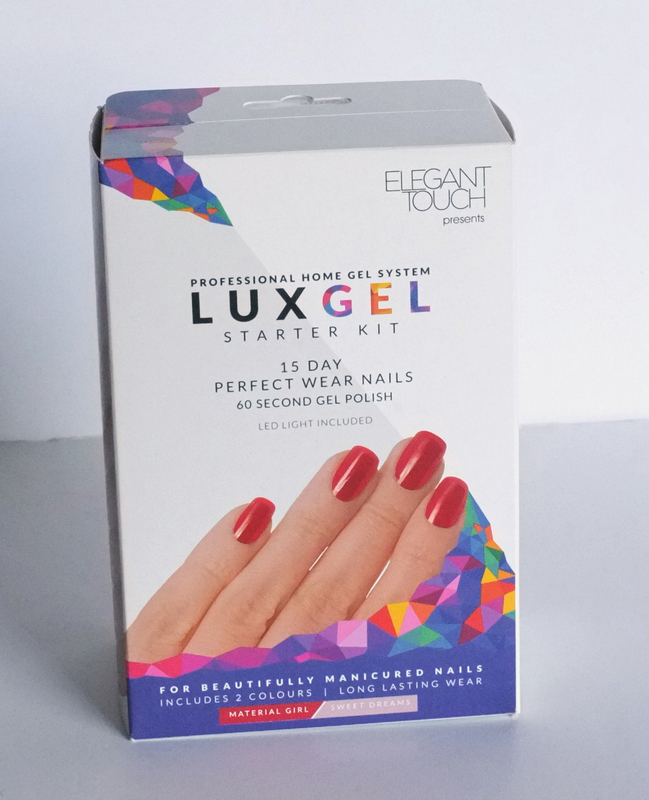 You can buy the Elegant Touch Kit here, the Gelish Kit here (as it's currently sold out on Nail Harmony's website), and the Red Carpet Manicure Kit here. What do you think? Have you tried any of these kits, or any gel polish, before? Do you want to? I'd love to hear your comments! I love my red carpet manicure kit. Light works with gelish polish too so best of both worlds. Only thing I would lve is to be able to fit my thumbs in at the same time as rest of my hand.